After a last-minute delay for NVIDIA's risky SHIELD gaming device, the company has just sent out an email to those who pre-ordered it. The delayed launch date is next Wednesday, July 31st, just barely making the company's revised commitment to a July launch. Pre-order hardware will be shipped out to customers on Wednesday, and NVIDIA's retail partners will have at least some units that day as well, at the new $299 price tag. We want to thank you for your patience and for sticking with us through the shipment delay of your SHIELD. We have great news to share with you - your SHIELD will ship on July 31st. Our goal has always been to ship the perfect product, so we made sure we submitted SHIELD to the most rigorous mechanical testing and quality assurance standards in the industry. We built SHIELD because we love playing games, and we hope you enjoy it as much as we do. 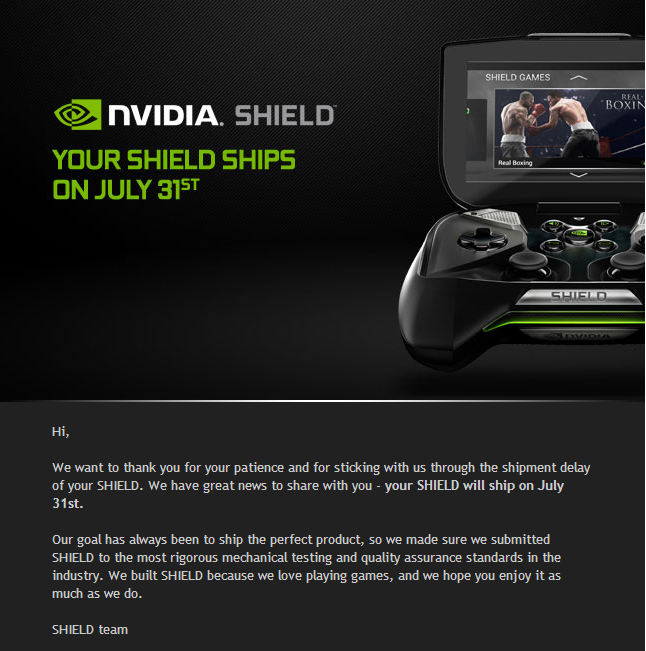 SHIELD was delayed on June 26th, the day before it was scheduled to go on sale. NVIDIA cited faulty hardware from a third-party supplier as the reason, though they still haven't fully explained the technical details of the problem. The delay means that SHIELD may not technically be the first device to market to use the Tegra 4 processer and SoC - Toshiba seems to have gotten its new Excite tablets onto a few Best Buy shelves in the interim. It also sets up a rather disheartening situation for pre-order customers: at least some retail buyers will have SHIELD in their hands while pre-order hardware is being shipped. Still, a $50 price drop on state-of-the-art hardware will forgive a lot, and the delay means that there will be more games taking advantage of the Tegra 4 and/or physical controls when SHIELD launches (see Riptide GP 2 and Skiing Fred for examples). So, who's still planning on picking up NVIDIA's first piece of consumer mobile hardware? Update: Here's NVIDIA's official blog post on the revised launch date. It doesn't have much information that wasn't already sent via email, but there will be console-style demonstration kiosks at some Gamestop, Microcenter, and Canada Computer stores. Also, there are T-shirts with the swanky SHIELD logo being packed in with online pre-orders and retail sales (in the same locations as the kiosks). Because everyone likes free stuff.